Today we'd like to share some more plaids from our team plaid project, this time from Kathy Berger. To make the two above plaids I stacked four unfolded baby wipes on top of each other. I then folded the stack until the stack was about 3" wide and narrow enough to hold easily. I then dropped a few drops of re-inkers onto the folded edge of the wipes, leaving a gap between the drops. I swiped the baby wipes across the card stock, and then re-inked the wipes, and swiped in the opposite direction. On the second plaid, once it was completely dry I used a straight-edge and coordinating colored Copic markers to draw lines in the plaid. 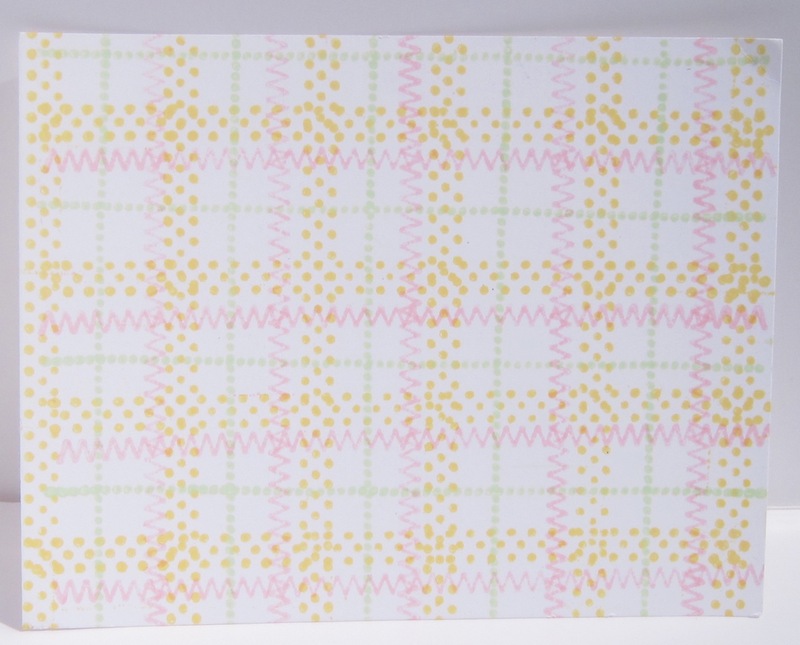 Here are the Easter and Spring cards I made with these plaids. I simply mounted my plaid onto a coordinating card-stock, and then to the card, and then added ready-made embellishments. This plaid was created with three different widths of line stamps like those made by FranticStamper. The plaid has a much more formal feel than the baby wipe plaids that I made. I thought was just perfect for this Easter Egg card, whose top pivots open and closed, exposing the Hoppy Birthday tag inside. After stamping the plaid with the line stamps, I thought it would be really fun to see what other "lines" I might have that I could use in their stead. I had a set of stitch stamps that I thought would fit the bill...and it did exactly that! This was my favorite of all the plaids I created, and was just perfect for this card to congratulate my cousin's daughter on the birth of her new baby. 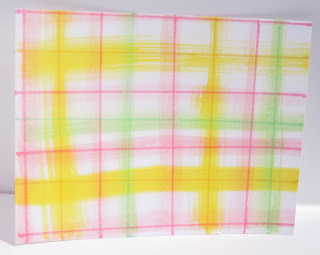 If you want to try making a plaid like this, the set I used is no longer available, but there is a stamp set from Lawn Fawn that would definitely be a good substitute. 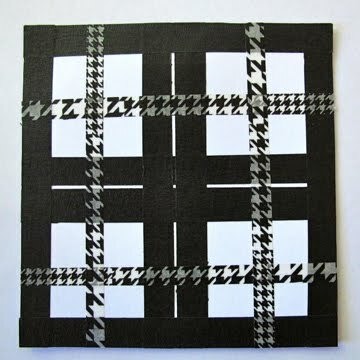 We continue our plaid project with a couple of techniques and cards by Lis Whiting. Lis here with a technique for creating beautiful plaids with alcohol inks. 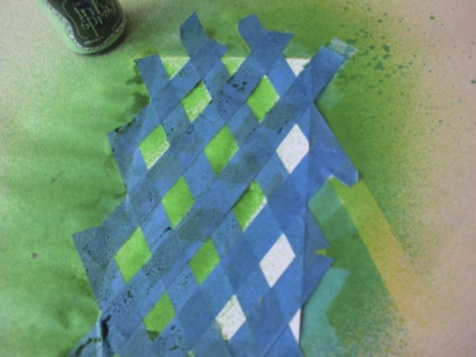 This is a Tim Holtz Technique; If you want to see variations, you can go to his blog and search for "alcohol ink plaid". My card was made by creating a plaid, stamping a balloon image, cutting it out, and adding it to my card front. 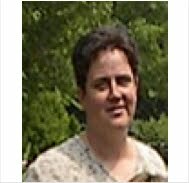 Use kromacoat white glossy cardstock (not photo paper or photo cardstock), cut to 4 1/4 x 5 1/2 Place your cardstock on a craft mat. Pick out 2-3 alcohol ink colors (I recommend two light and one dark). Using your blending tool with a felt pad. Place a couple of drops of each alcohol ink on your felt tool. Be sure to add your inks in a line across the width of the tool. Place your tool on the paper and pull it from top to bottom. Turn your tool around, place it at the top again to color the next section, and pull down. The reason you turn your tool around is that this creates a wider single color bar. This is pleasing to the eye and provides some variety. Continue turning and dragging the tool until you have stripes running top to bottom on your paper. Turn your paper 90 degrees so that the stripes of color are now horizontal. Reink your tool as needed (same colors). You have plaid! Now USE it! There are lots of ways to use these plaid sheets. You can stamp on it (use Ranger Archival Ink- not Stazon ink as Stazon will react with the alcohol ink). 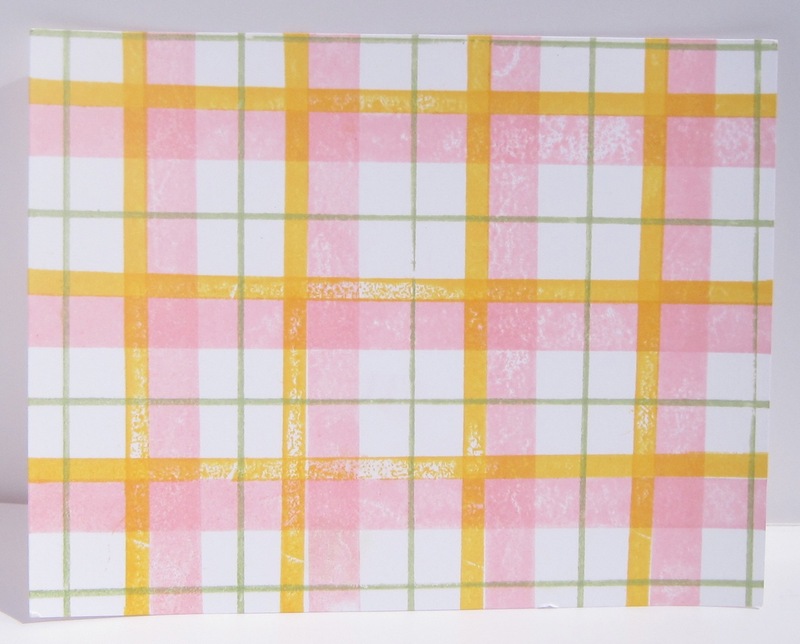 You can cut shapes from your plaid sheets and add plaid embellishments to your cards. 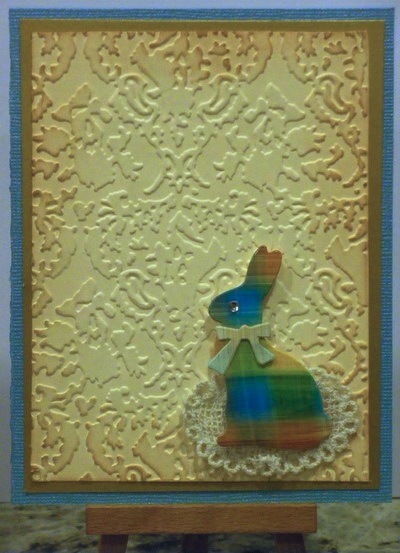 Here is a little Easter card produced with a technique similar to the one above, but with bright colors. 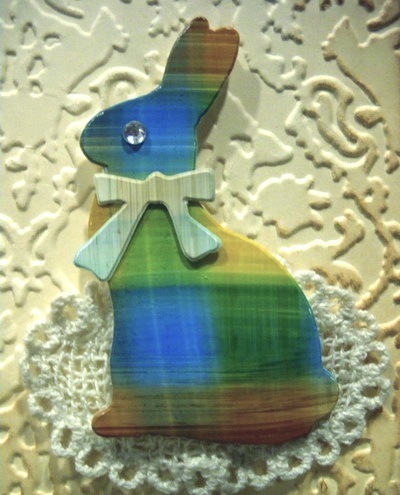 I die-cut the bunny from my plaid and added it to a card that I had embossed with an embossing folder. I hope you enjoyed my plaid projects today! 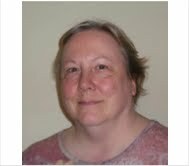 In continuing with our plaid projects, Linda Phinney has a few plaid techniques to share with you today. Enjoy! 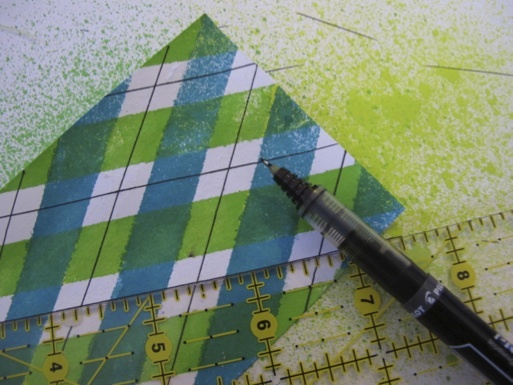 Create a grid on card-stock with painter's tape and spray first color. Let dry. 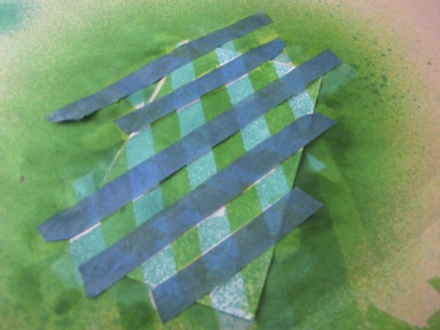 Pull off one layer of tape and spray the second color. Let dry. 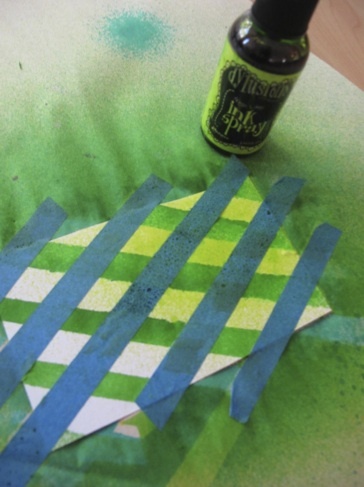 Peel the current layer of tape off the card to expose the white and put it back on over the color you just sprayed. Spray the third color. (You will cover your second color). 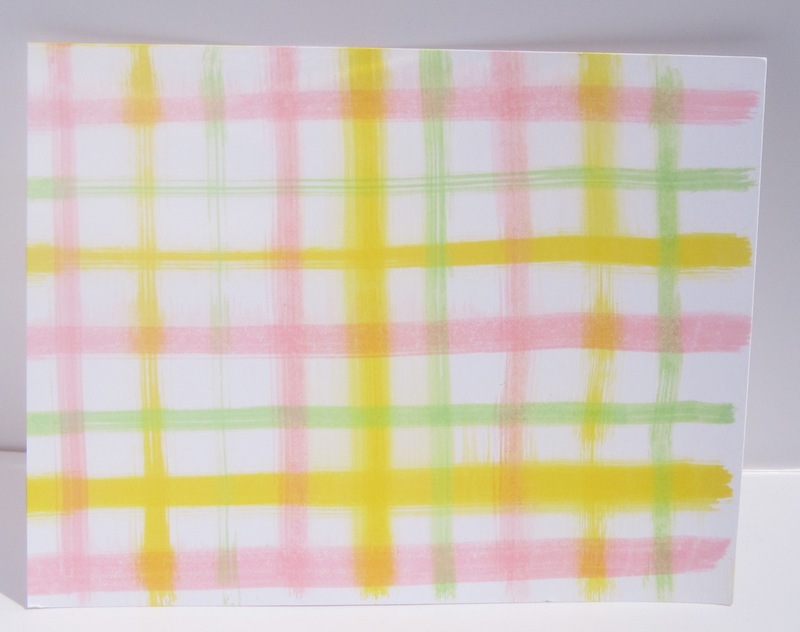 Remove all tape and use a black pen to make lines in the white to finish off the plaid. And this one was made with rubber bands wrapped to criss-cross around a wooden block (I later realized cleanup would likely have been easier if I had used an acrylic block instead). 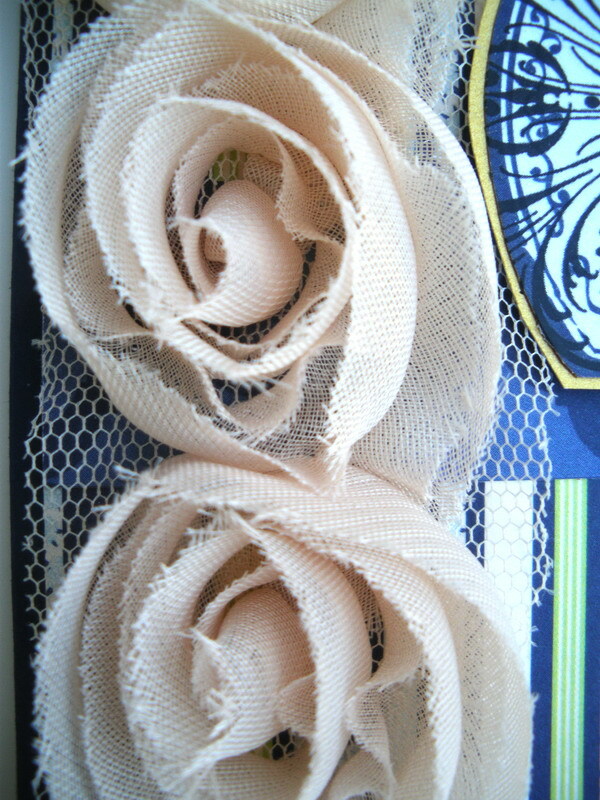 I think this would make an interesting basket-weave, too. About a year ago a plan was proposed to the then new Frantic Stamper Design Team; It was all about Plaid. 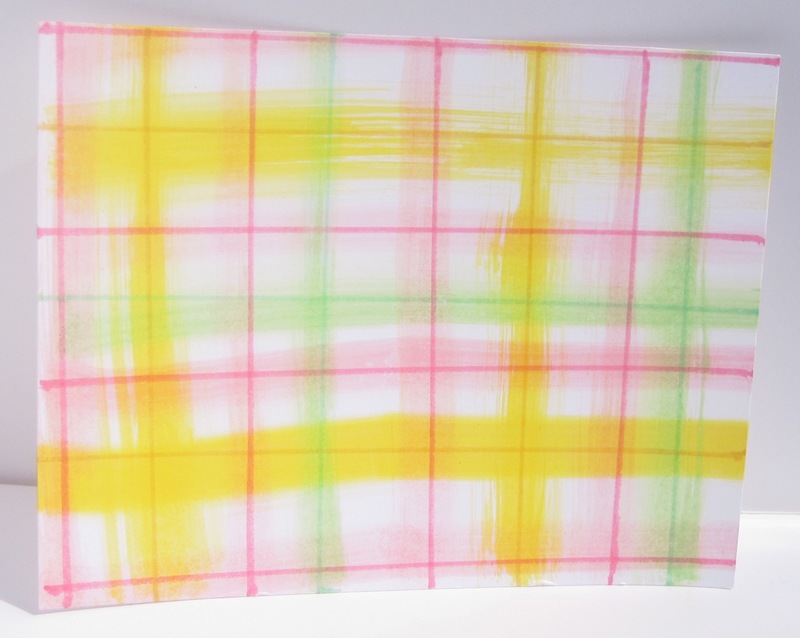 The team was to use various techniques to make their own plaid papers, and then they were to use those plaids to make projects to share. But not only were they going to share the projects, they were going to share the techniques for making the plaids. 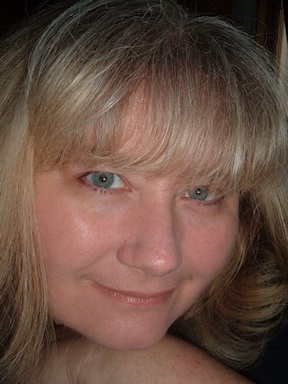 Unfortunately, the projects came in later than others, making some of the earliest projects seem untimely. So we held the project back until now, when the projects "fit" the times a little better. We think we have some pretty fun stuff to share, and we think the time is now. We hope you'll agree. 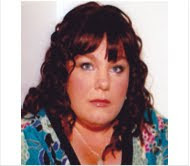 Today, we have Sharon Jeffs' contributions. Enjoy! To make the plaid on this card I inked Frantic Stamper's line stamps with Distress ink and stamped them. Once dry, I stamped the thin lines using Picket Fence Distress Stain. For my second try with the plaid I decided to do a very similar thing to my first card with the distress inks but instead of adding in Picket Fence lines, I decided to spritz the whole background with water and once it began to bleed out I dried it. I loved the idea of card three straight away. I originally was going to use strips of JAC paper and glitter to create a plaid but then re-discovered my Distress embossing powders this week and decided to have a go with these. I first colored the background paper though with Tattered Rose Distress Ink to give a vintage feel to the paper. 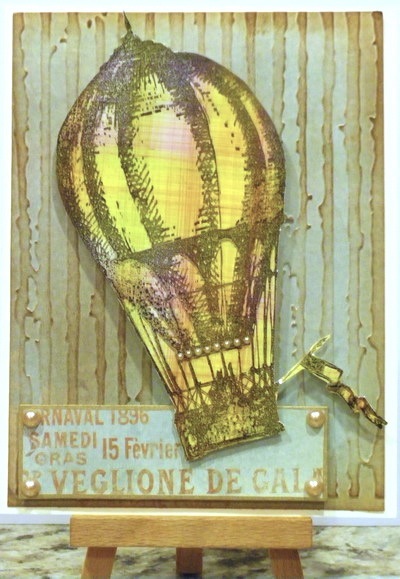 For my fourth and final card I decided it would be fun to play on encaustic art and so I hand drew my lines with crayons then used a flat based iron to iron off the wax to leave a really unusual plaid. I hope you have enjoyed my plaid projects. Please check back tomorrow for more plaid inspirations from other team members. Today's card uses a slightly different sized card and fold. It starts with a piece of white card-stock that was 4 1/4" x 9 3/4", scored at 4 1/4", making a card front that is 4 1/4" square, and a card back that is the standard card size, 4 1/4" x 5 1/2". I used some wonderful new Easter papers and stickers from Echo Park's Happy Easter Collection to make this card. My little bunny, though, was die-cut using the super-cute Chocolate Bunny from Impression Obsession. I inked the edges of my bunny and all my paper pieces using Victorian Velvet Distress ink pad and a finger-tip dauber. My bunny got finishing touches of a small wiggle eye and a 1/4" white pom pom tail. I hope you've enjoyed my playful, springy Easter card. I also hope you'll give the different card shape a try! We have yet another fun card video for you from Hero Arts today. This video shows a great way to get more out of your dies by die-cutting only a portion of them. Be sure to check out all the fabulous Hero Arts products available at www.franticstamper.com. Enjoy! Recently I bought myself a new camera - an upgrade from my old SLR and I've been loving taking photos of everything at avery possible moment. This page features a photo taken with that new camera, of my oldest daughter sitting in our garden. 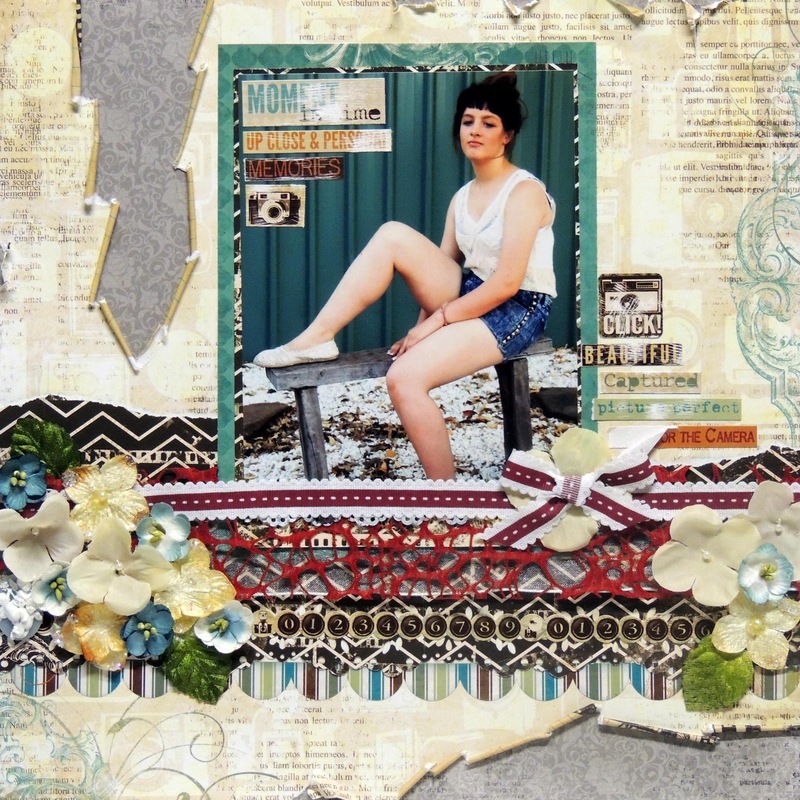 This page is created predominantly with papers from the Bo Bunny Mama-razzi range. To create the distressed effect I chose to use to finish off my page, I used a Prima Craft Distresser which had all the tools I needed from sanding my stickers to distressing the edges of my paper! Today I would like to share a card I made using the FranticStamper image titled Chicken. 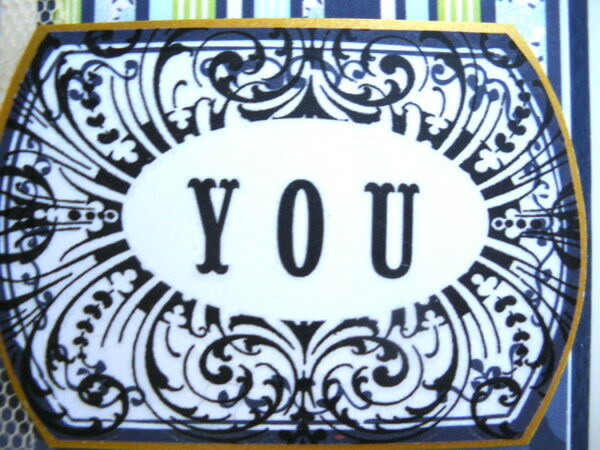 To create this card stamp the image on white card stock, using Memento Tuxedo Black ink and color with Copic Markers. Trim the image out and adhere on a red mat cut to 3.75" square. Mat once more onto a light brown card stock cut to 4" square. Wrap the leaf vine around the corners of the matted image and adhere the 3D foam dots to the corners of the back of the matted image. 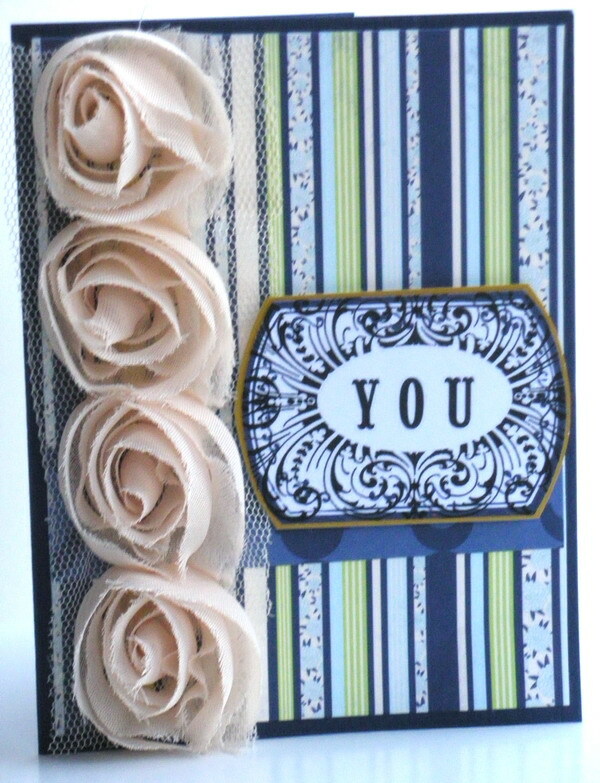 Cut a dark brown card stock to 6x12 and fold in half to create a square card base. Tear a strip about 2" x 6" of the Authentic Lively paper and adhere to the left side of the card with the wood print visible. Adhere the matted image to the center of the card front. Embellish the four corners with the dark brown colored Dew Drops. Enjoy sharing! This card started out to be a quick card, but once I got going on it, I just kept having to add details, and the quick card ended up taking a little more than an hour to make. Oh well. It was worth the time, I think! I started by wiping three shades of blue distress ink onto an acrylic mount. I lightly spritzed the mount with water, and then pressed the mount onto a piece of watercolor paper. I let it sit for a minute or so to let the color sink into the paper, and then lifted off the mount. I had a lovely blue backdrop for my bird. I quickly dried the paper with my heat gun. Next I stamped the Frantic Stamper Bird on Pussywillow image over my blue backdrop with Memento Tuxedo Black ink. I colored my bird with Inktense watercolor pencils and a water-brush. I wasn't happy with the willow buds as they were, so I decided to flock them with white flocking powder. While the glue for the flock dried I worked on my background layer and my tag. For the background I rubbed Faded Jeans distress ink directly onto a piece of white card-stock. I then spritzed that with water mixed with a small amount of Pearl Perfect Pearls. It gave the card-stock a quiet shimmer. I cut a small piece of watercolor paper into a tag shape and then covered it with a piece of white card-stock (I wanted the sturdiness of the watercolor, but the color and texture of the card-stock). I stamped my note saying onto the tag, and colored it with Inktense pencils and a water-brush. I punched a hole, and added a hole-protector punched from a scrap of my blue background paper. I punched two small holes in my stamped watercolored image. I threaded a piece of blue baker's twine through the two holes so the ends were to the front of the image. I passed one of the ends through my tag, and then I tied the tag to the image with a bow. I then glued my background piece to my standard white card, and then used strong tape to adhere my watercolored image to the background, finishing the card. I hope you have enjoyed my little birdie card! Today I would like to share with you the image titled Chicken from the FranticStamper line of cling mounted rubber stamps. I have to admit, I love chickens. 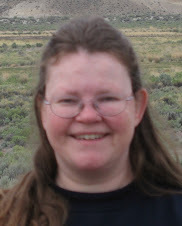 About ten or twelve years ago, my husband and I tried the homesteading gig and I became quite adept at hatching out chickens. We went from half a dozen game birds to a flock of over 50 mixed breeds in about a six month period of time, it was crazy fun. I have colored this image to match some of the birds we had at the time. My image was stamped with Memento Tuxedo Black ink on cheap white card stock and colored with Copic Ciao Markers (the list of items can be found below). I like to have a small stash of cards that I can send just because. The card I made for my stash is a sweet card that can be used for women and men. I started with a dark blue, almost navy color cardstock and folded to make my A2 size card. 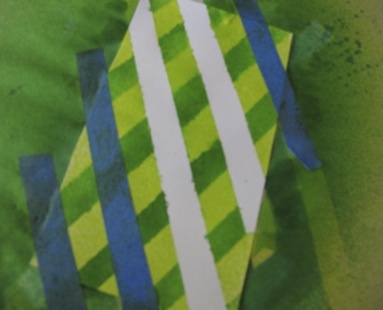 Then I added a 4 x 5 1/4 inch paper in Messy which is a pretty blue and lime stripe. I chose Me & Mine , a dark blue on blue pattern, and cut a strip about 1 1//2 wide x 4 inches long and added that to my card. I cut one of the labels from the Family Is Me & Mine paper (the other side - two sided paper is always a bonus!) and used gold glossy to mat it. The design you see on my label comes from a rub on. There you have it! My card, in ten. Although it is finally spring, much of the country is still feeling as though it is winter. Erte's warm coat and hat seem quite apropos! Linda colored this image with a Memento ink pad and Tombow markers. She first applied the color to a Ranger non-stick craft sheet, and then grabbed the color with a water brush, and painted it onto the image like watercolor. 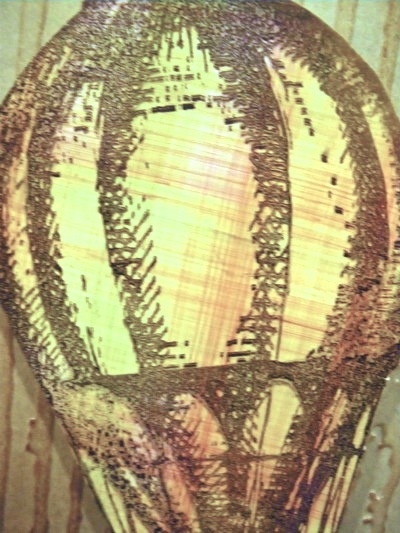 Most water-soluble inks (dye) can be used this way. We have another fun card video for you from Hero Arts today. This video shows a fun way to do a single layer card (always a struggle for us!) using a background stamp and colored pencils. Check out the Hero Arts products used in the video at www.franticstamper.com. Enjoy! 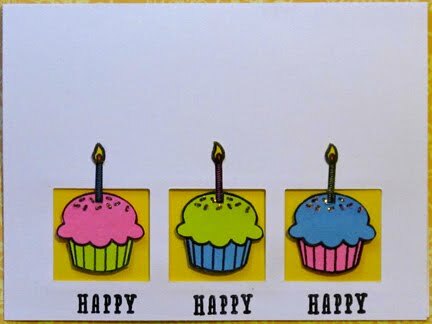 Linda's bright and cheery card showcases her three cupcakes perfectly! 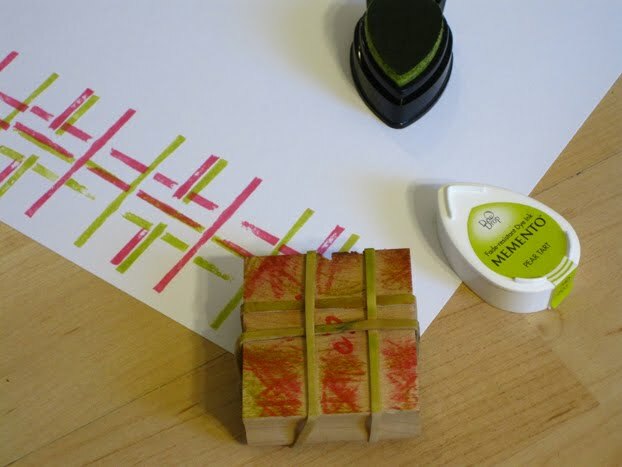 To make her card base, she cut her three squares in a piece of white card-stock with a FranticStamper's Precision Die, stamped the word "HAPPY" under each of the squares, and mounted the piece onto a bright yellow card. Then to finish up the card, she stamped her Hero Arts cupcake image three times on white card stock and three times on brightly colored papers: pink, lime, and blue. She then fussy-cut all six of the cupcakes, including cutting on the line between the cupcake and the frosting on the colored papers. She cut off the flames on the colored candles. She mixed and matched the cupcakes and the tops, attaching them to the white cupcakes. She colored the flames on the candles in a yellow to match the card.. And lastly, she affixed the cupcakes in the squares, with the candles extending out of the squares, with foam dots.